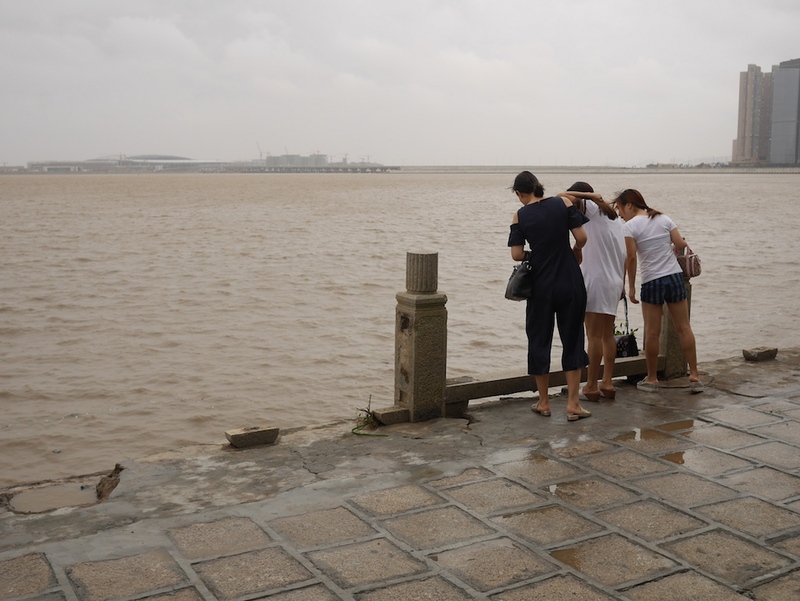 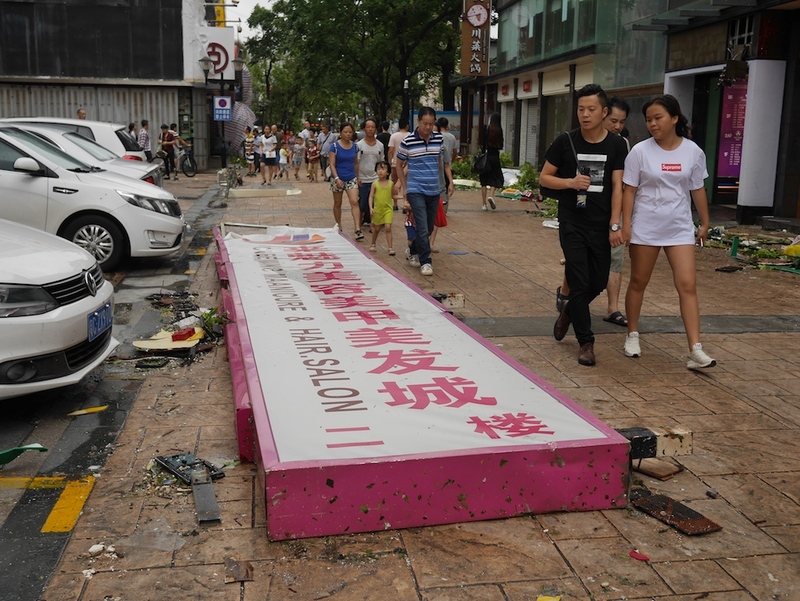 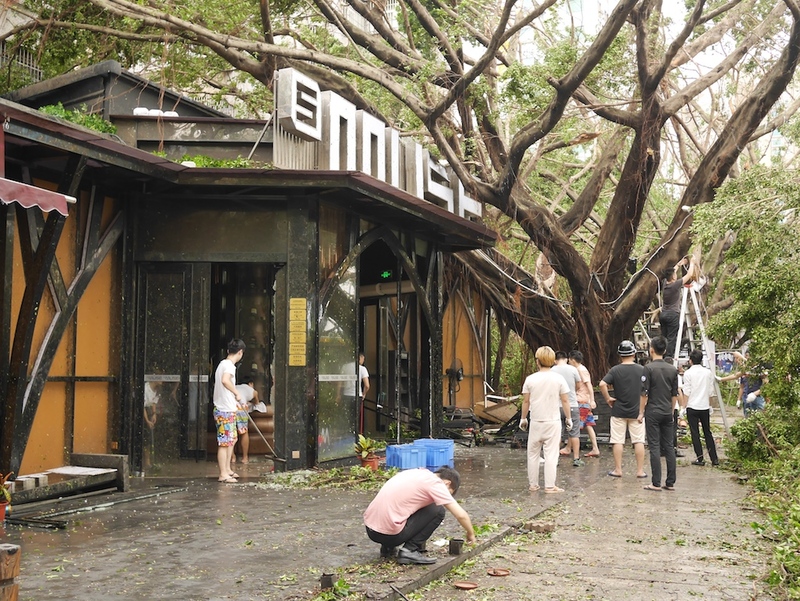 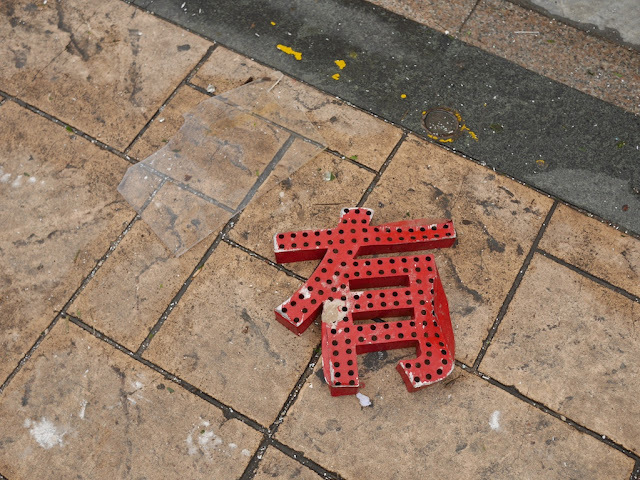 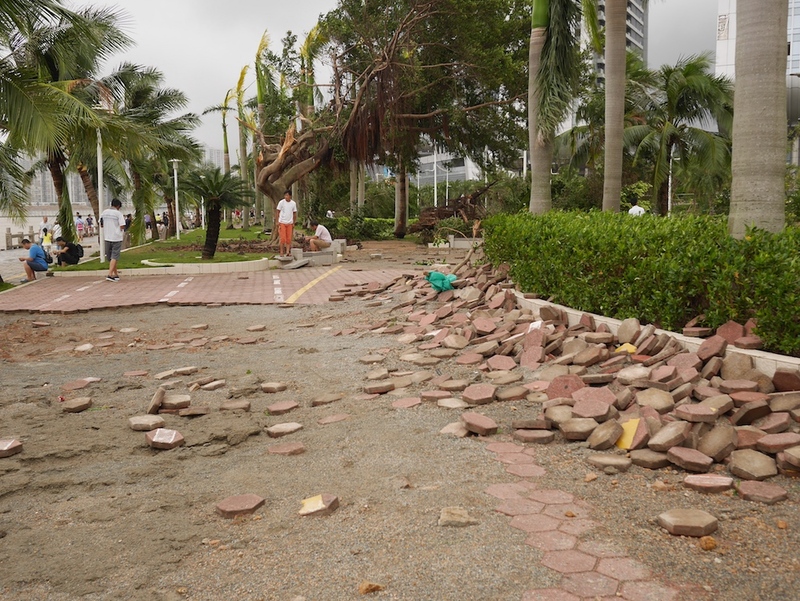 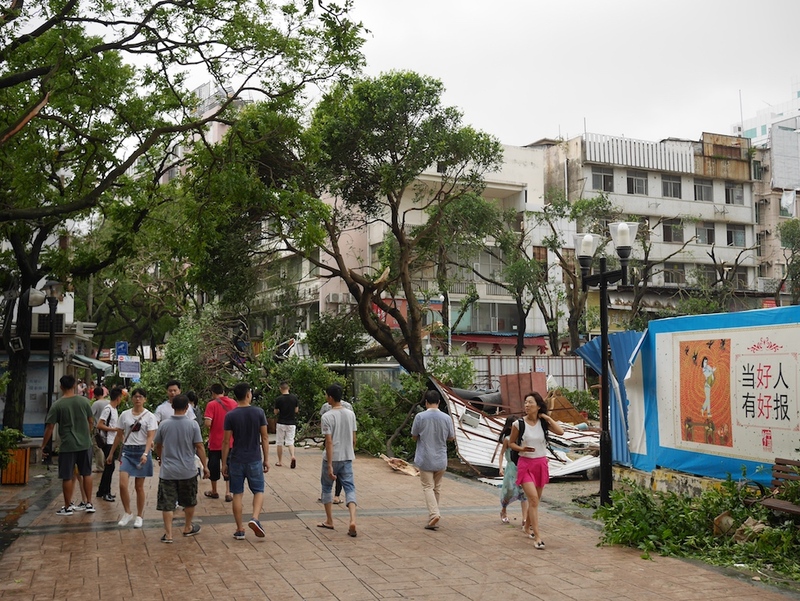 Whether at a pedestrian street, near the waterfront, or at a bar street, people did their best to navigate the debris left by Typhoon Hato in Zhuhai. 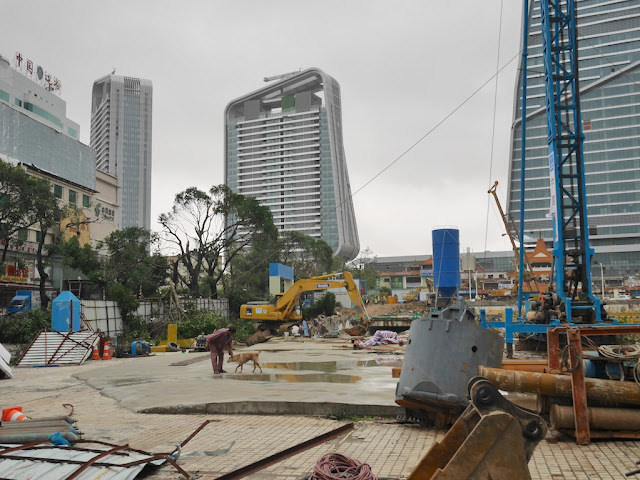 One notable example elsewhere in Zhuhai was on Baishi Road (白石路). One day after the typhoon, people on foot and riding various vehicles made their way under a tree that had fallen across the road without completely obstructing it. 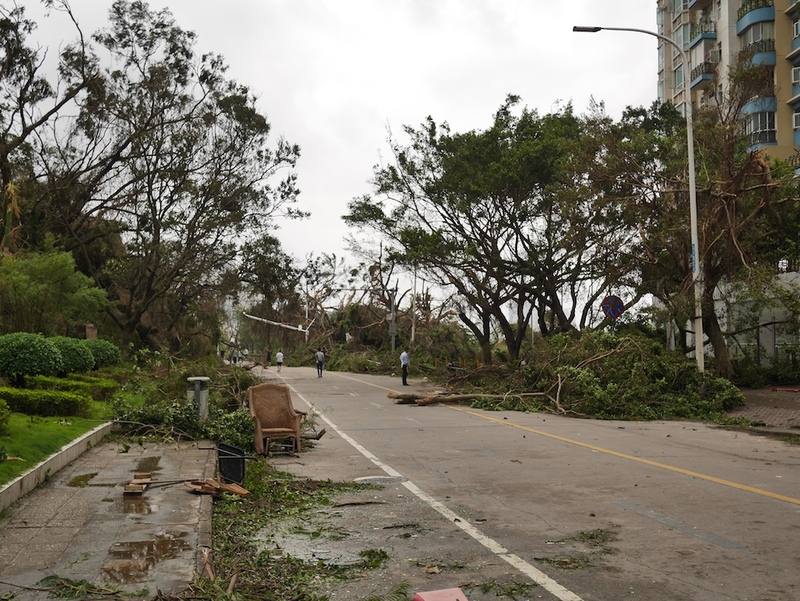 Some larger vehicles clearly would not have been able to pass, but while I was there I didn't see anybody turn around. Before deciding to move forward, though, a number of people paused, including myself. 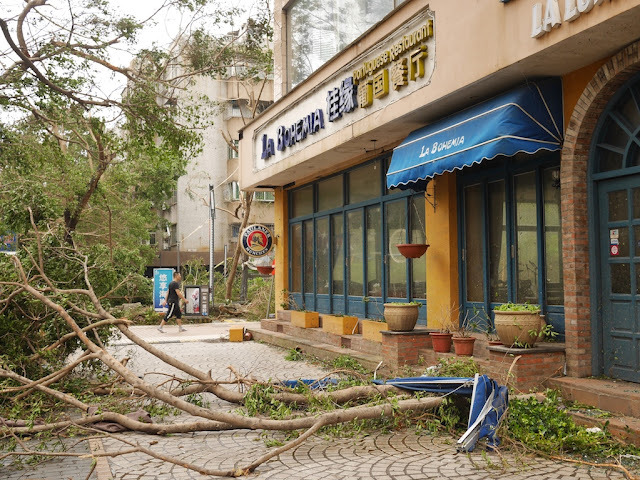 After surveying the damage at the Lianhua Road Pedestrian Street and near the waterfront at Qinglu South Road from Typhoon Hato in Zhuhai I headed to the Bay Bar Street (海湾酒吧街), also known as the Shuiwan Bar Street (水湾酒吧街) and simply Bar Street. 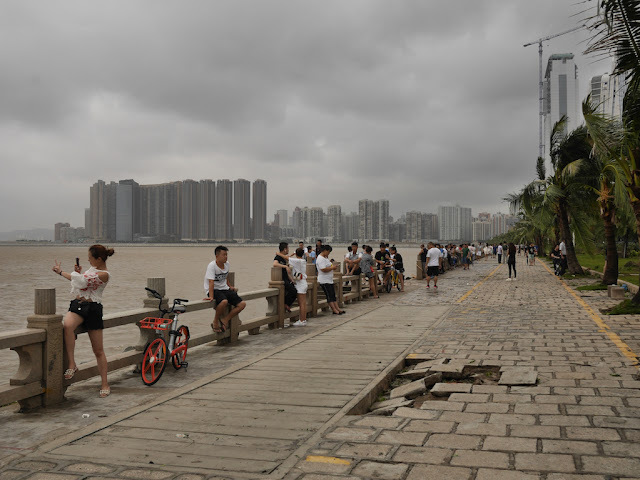 This section of Shuiwan Road just one block from the waterfront is lined with restaurants, clubs, and, not so surprisingly, bars. I typically stop by there at least once any time I am in Zhuhai because of the food at a favorite place. 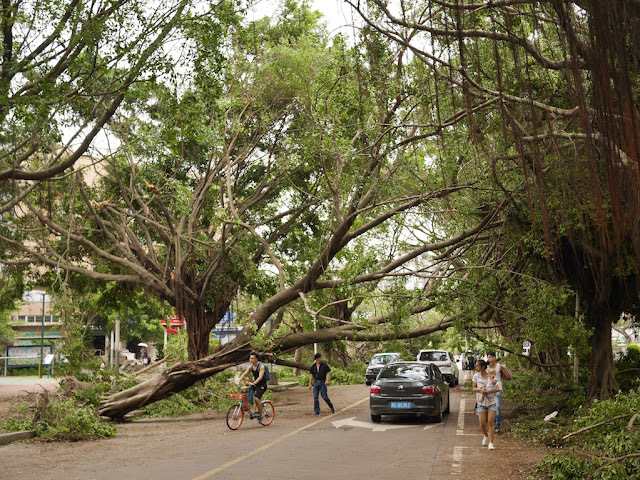 The bar street was also notable for the thick green canopy covering most of its length thanks to the rows of trees on either side. 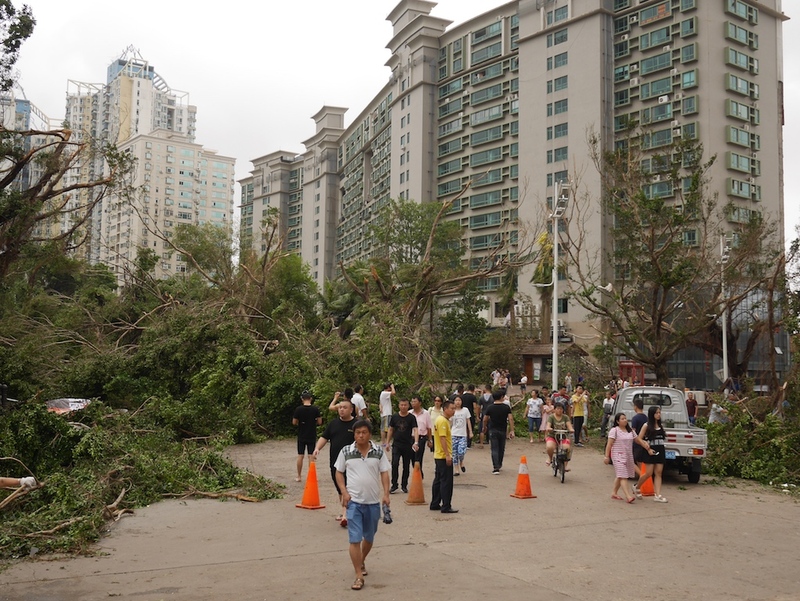 After the typhoon, though, much of that canopy was gone and the scenes seemed surreal. 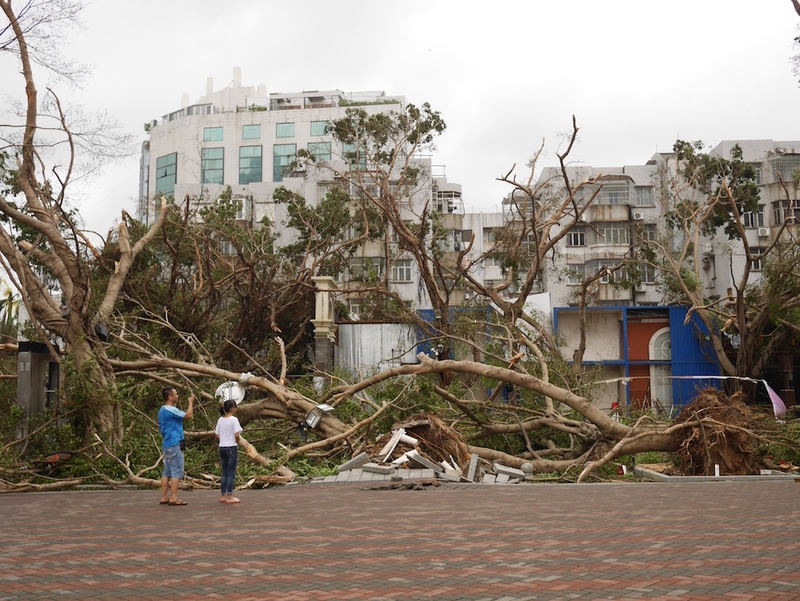 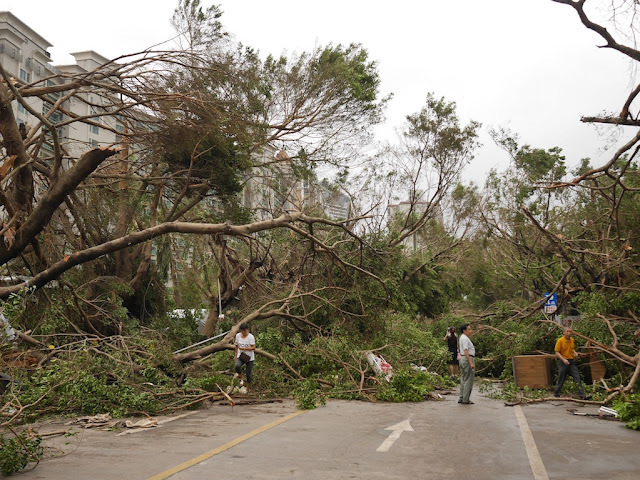 Below is a set of photographs taken only hours after the typhoon had hit there. 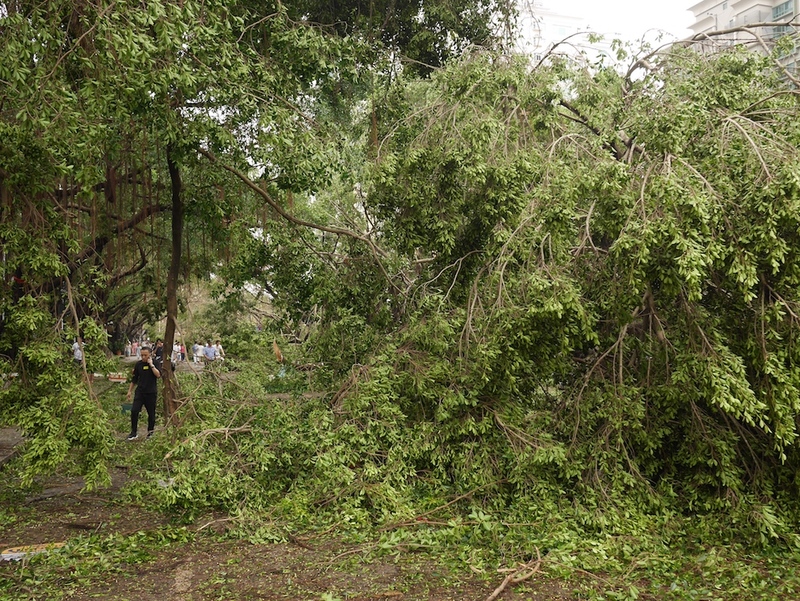 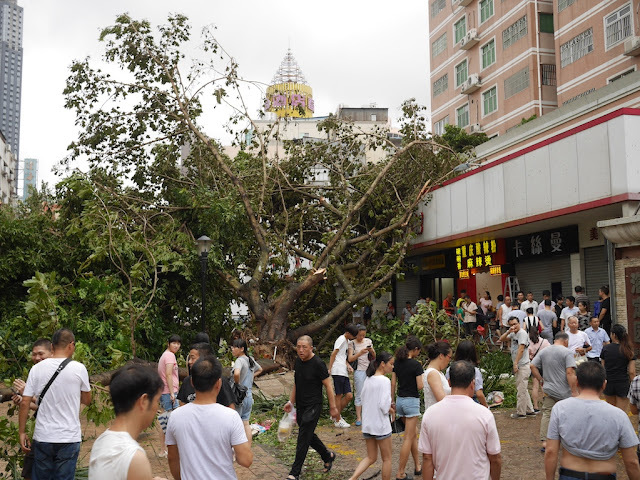 In addition to the numerous fallen trees, they capture people taking photographs, making their way through debris, collecting scrap material, cleaning up, and attempting to cut some of the tree branches. This is one street that even after the cleanup is finished where the effects of Typhoon Hato will remain easy to see for a long time to come. 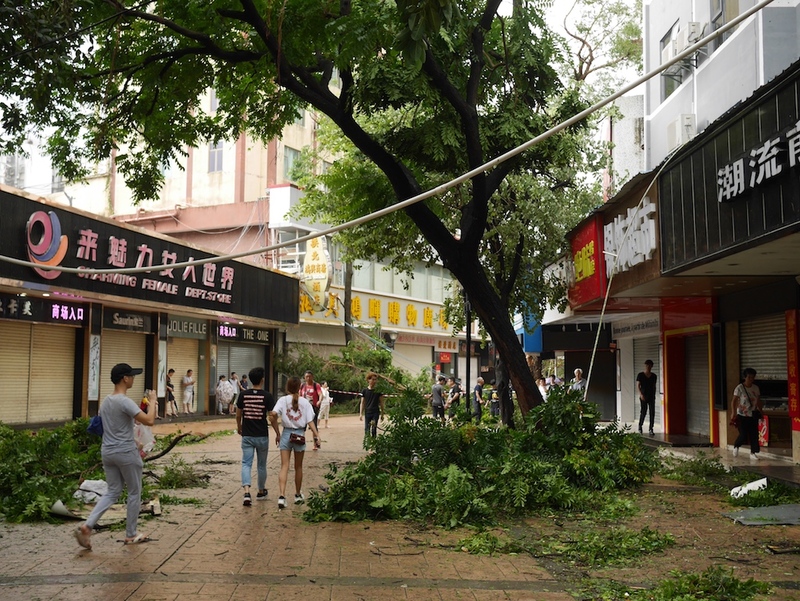 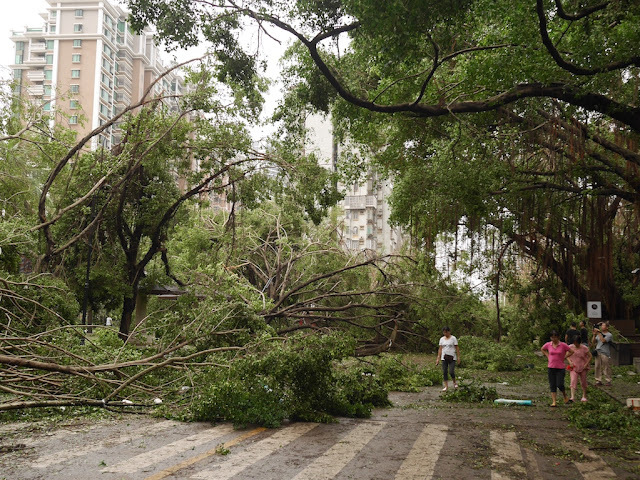 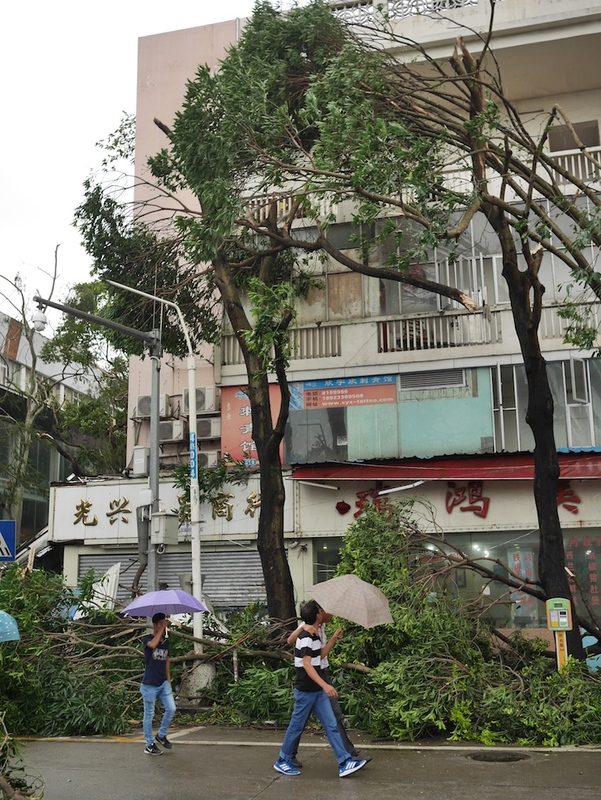 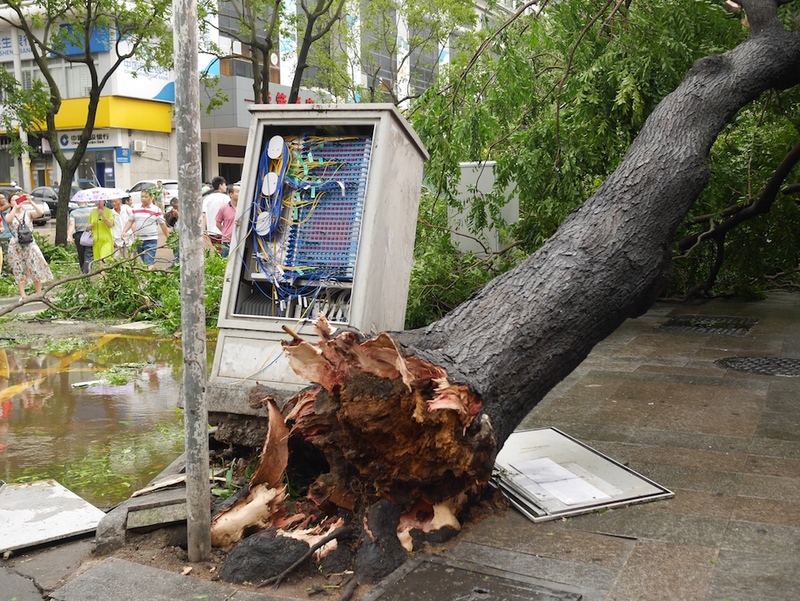 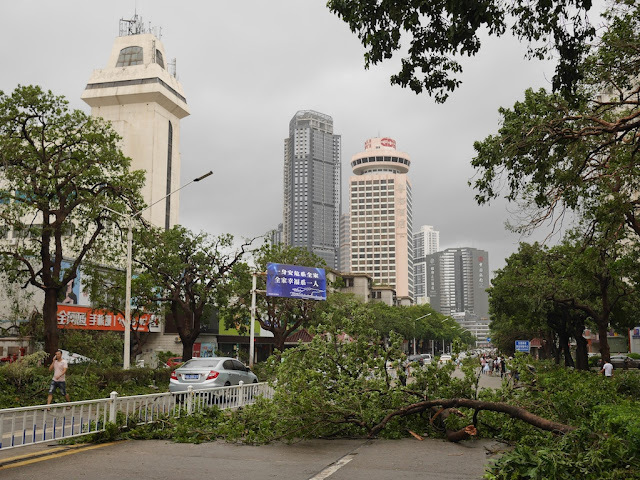 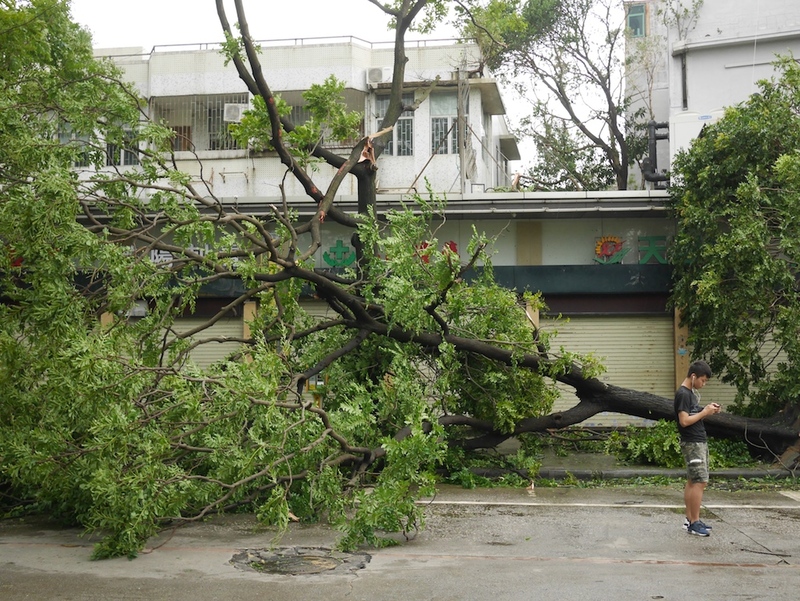 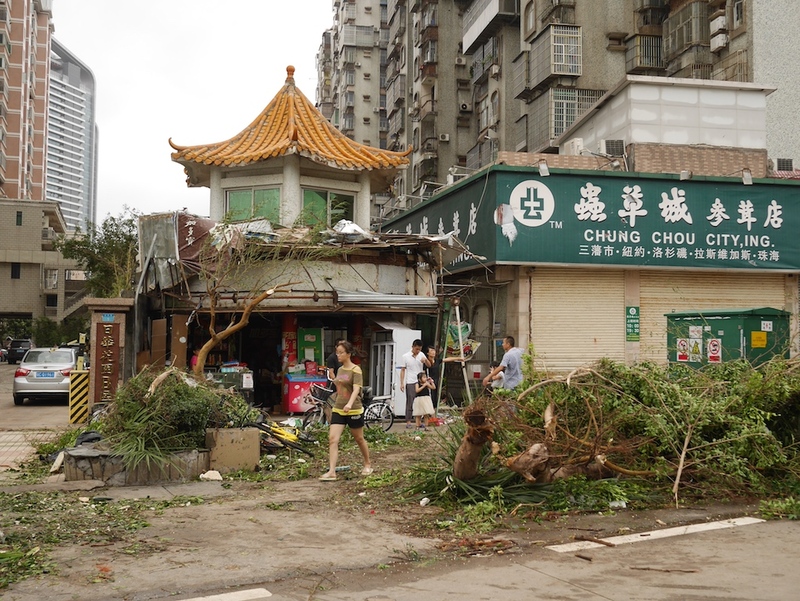 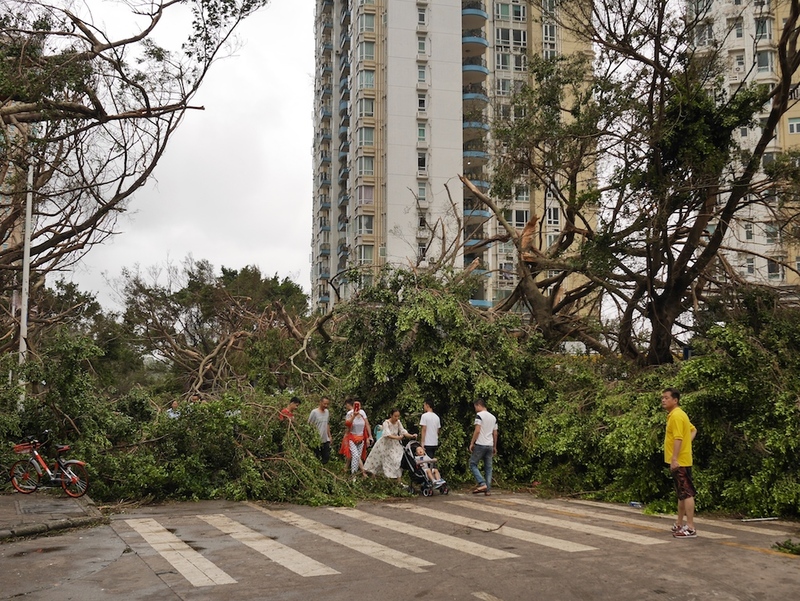 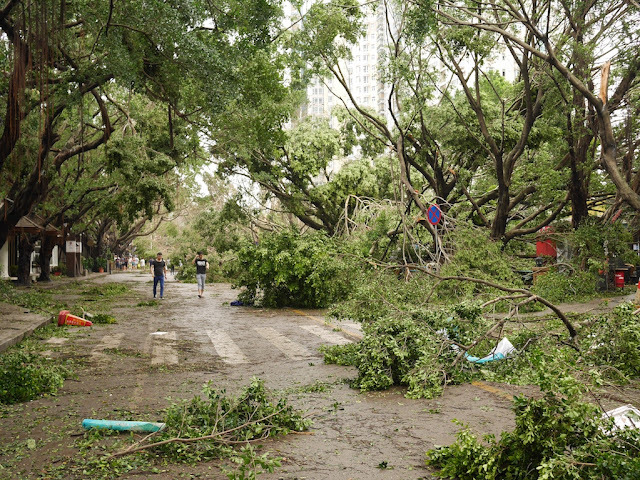 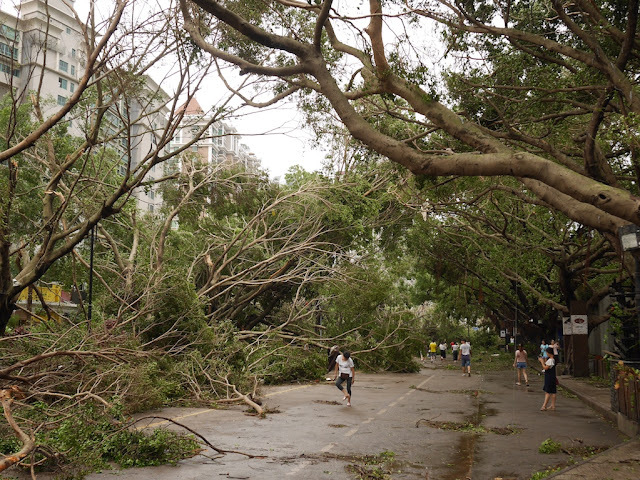 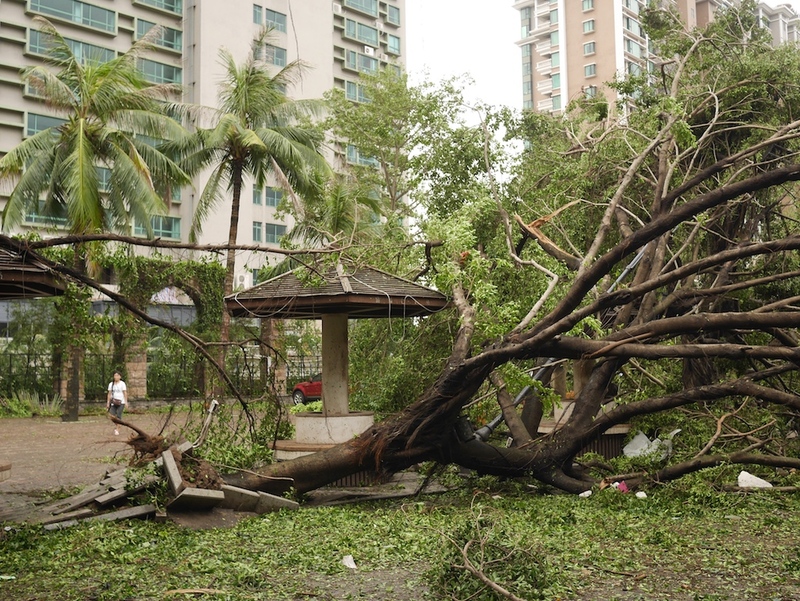 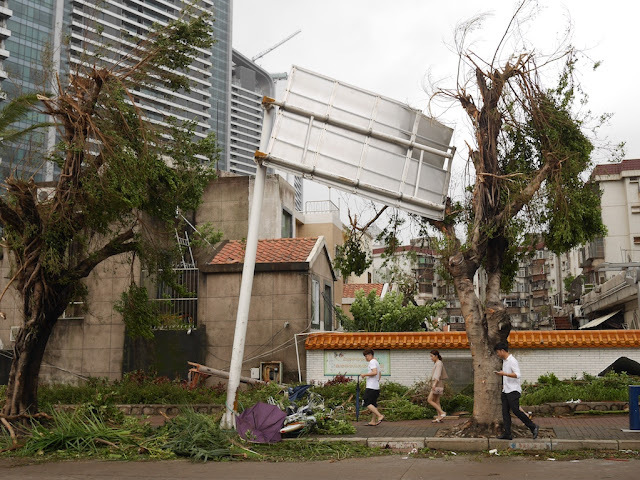 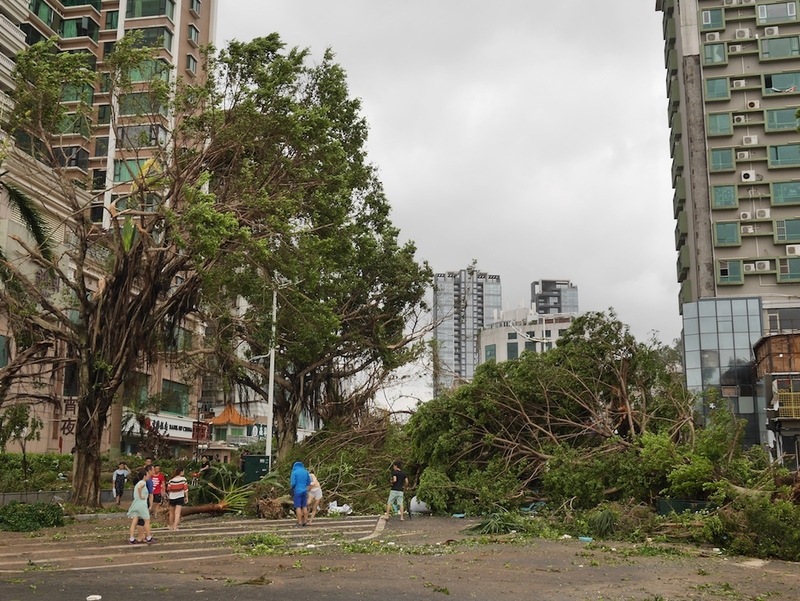 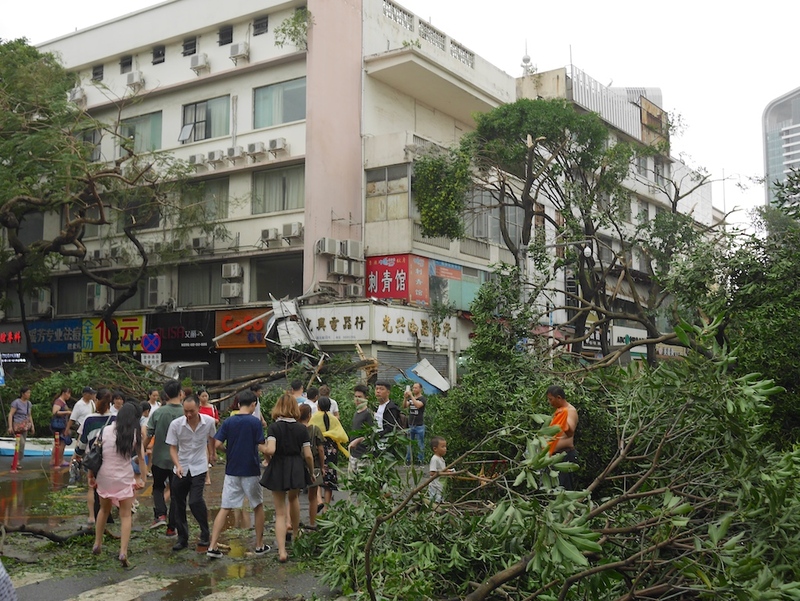 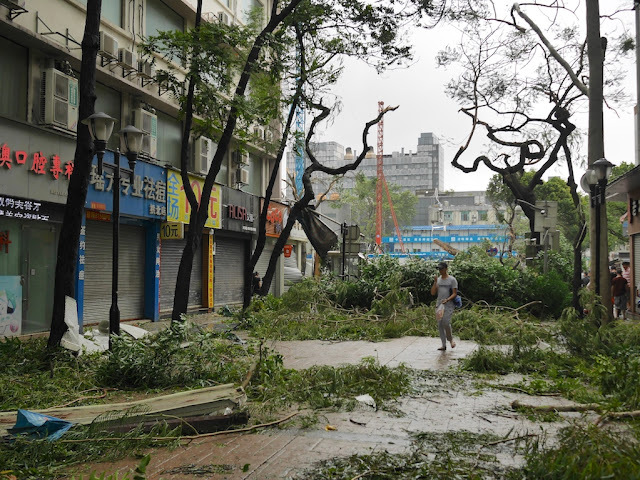 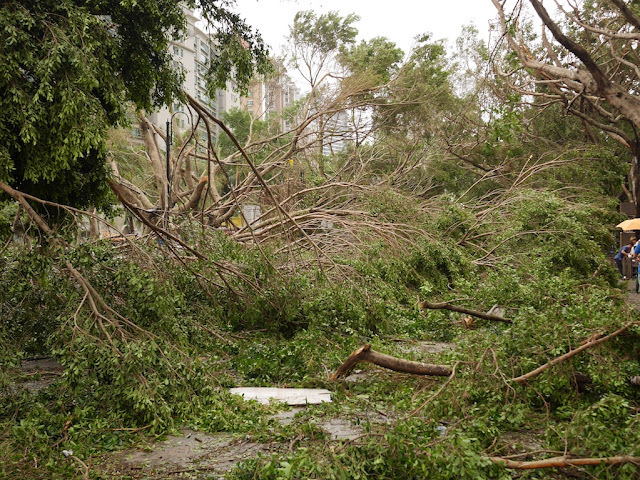 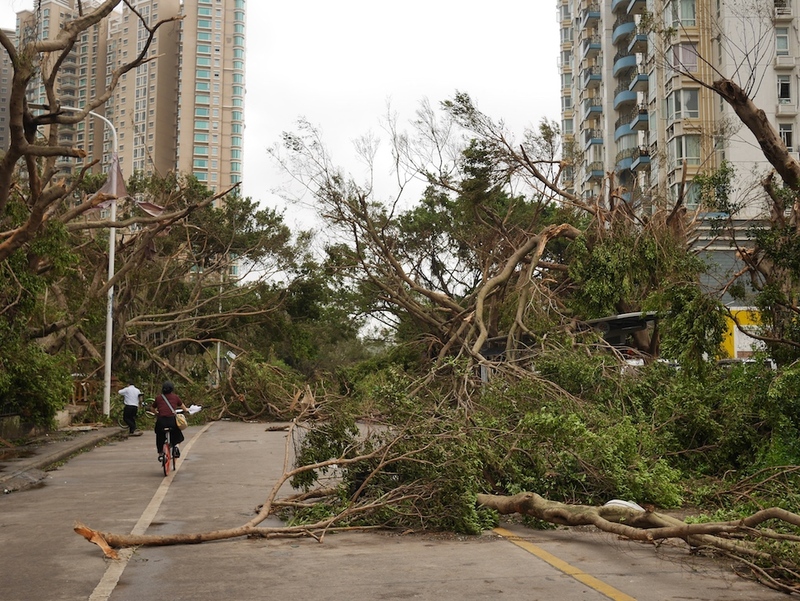 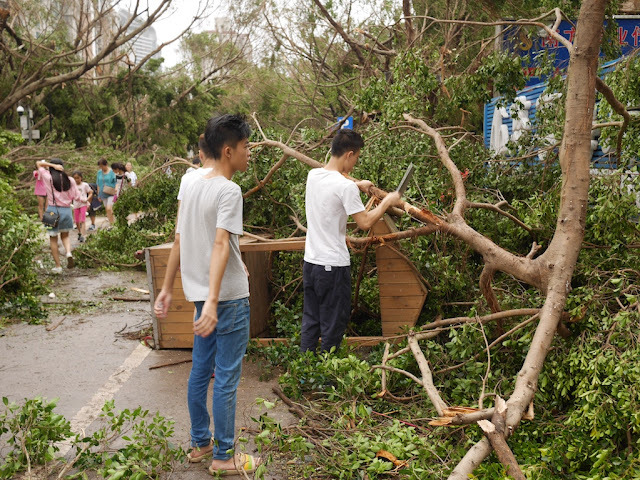 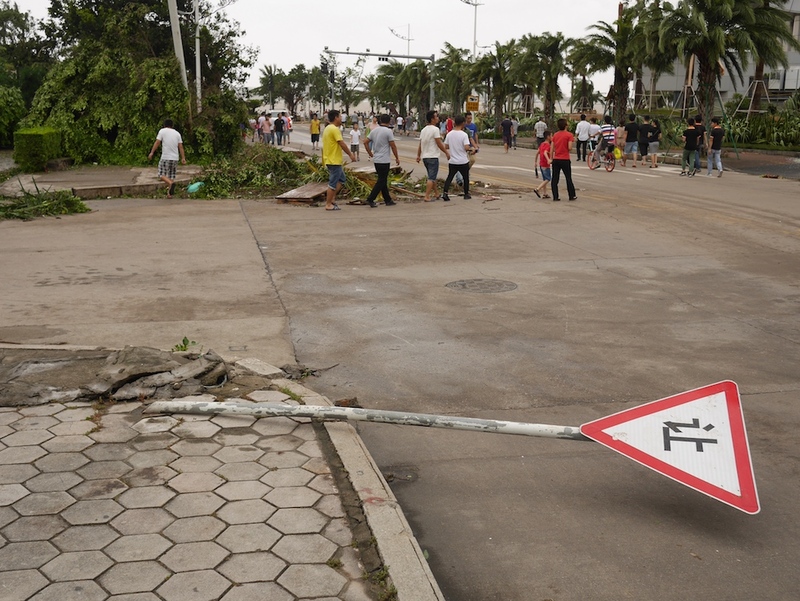 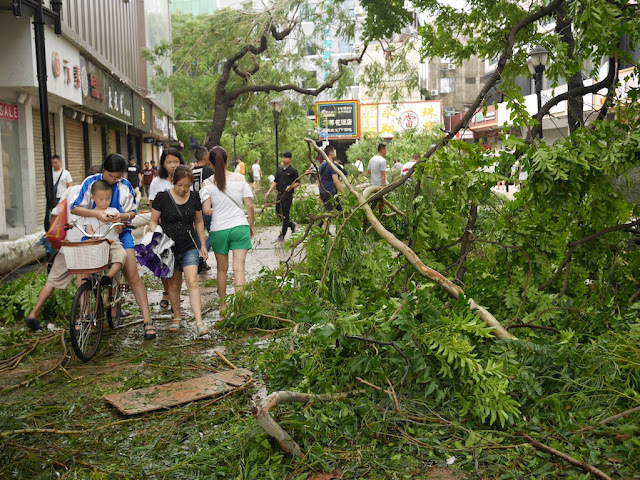 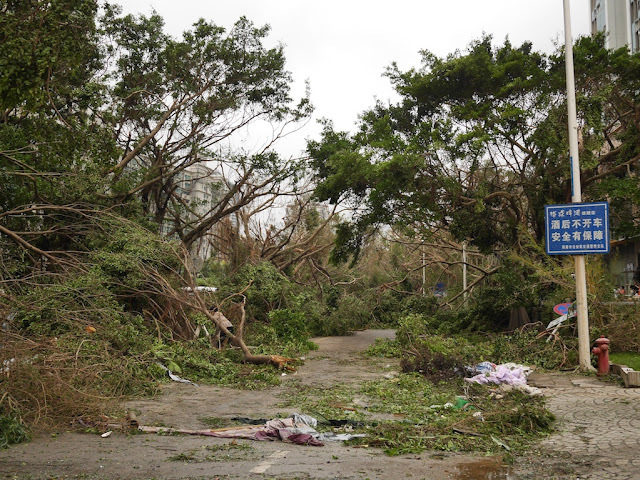 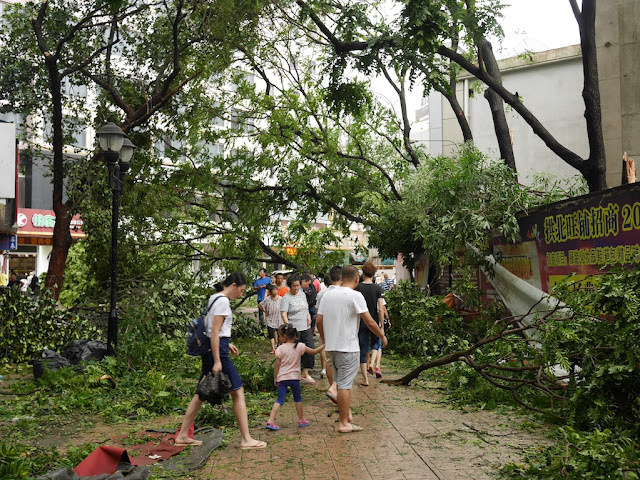 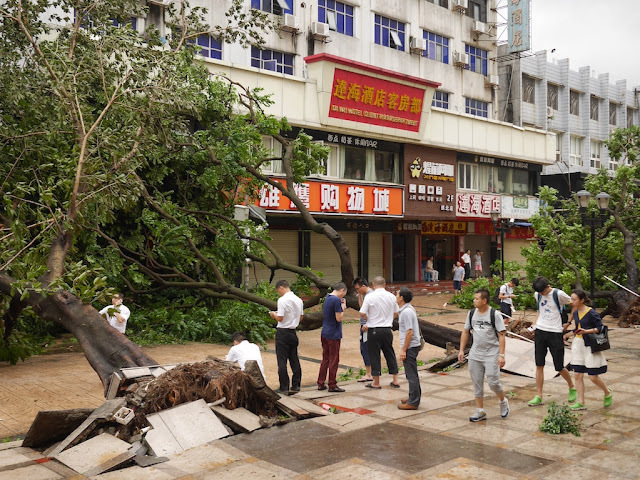 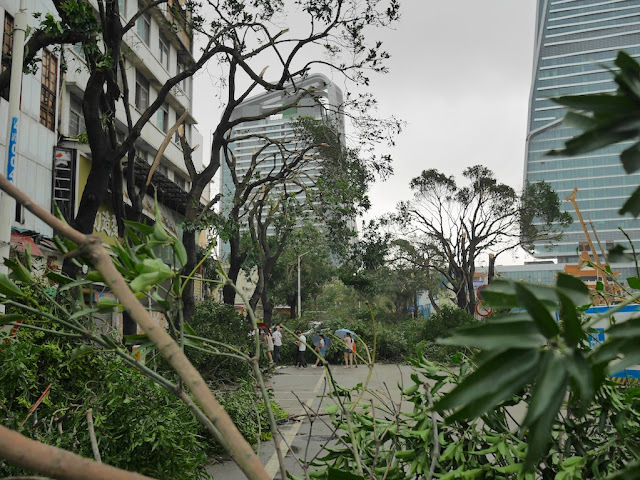 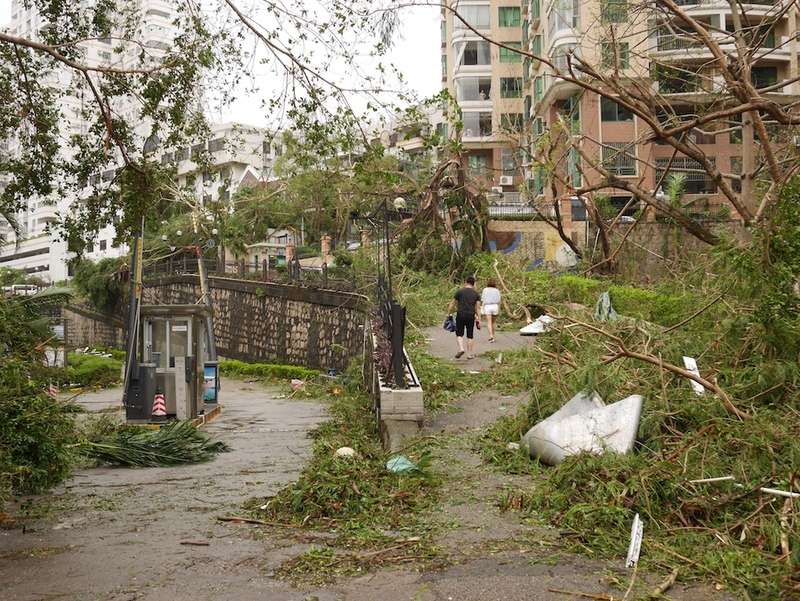 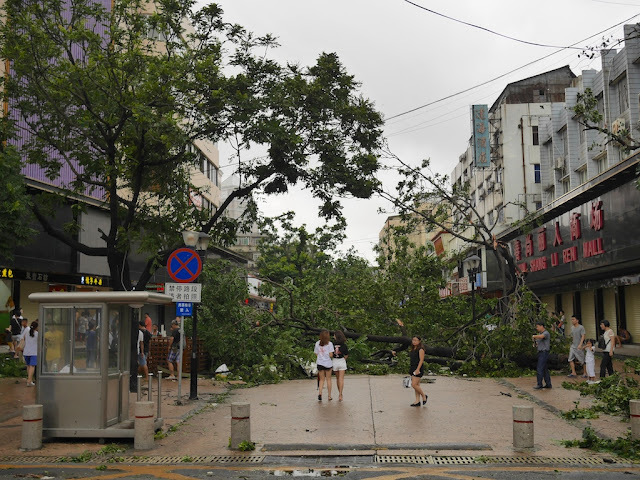 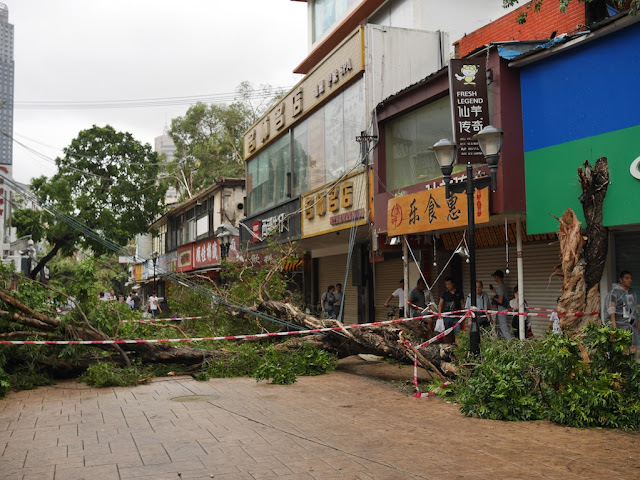 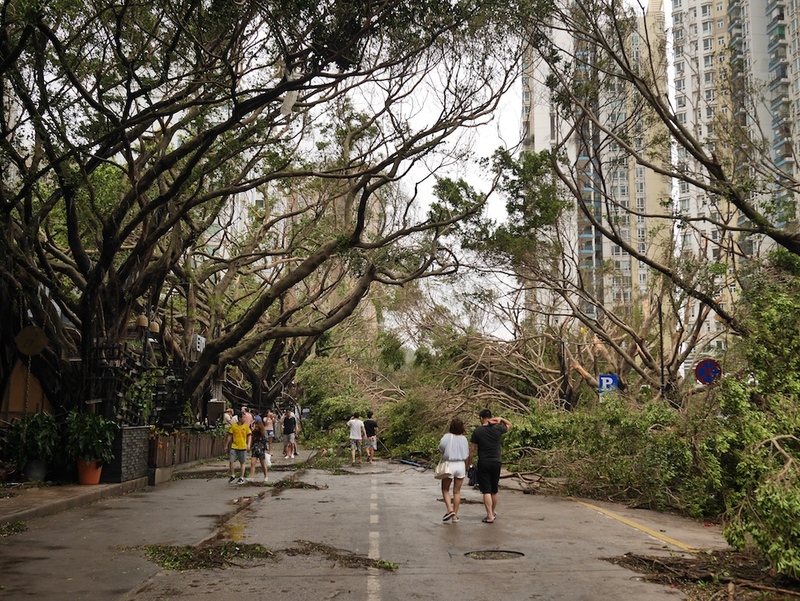 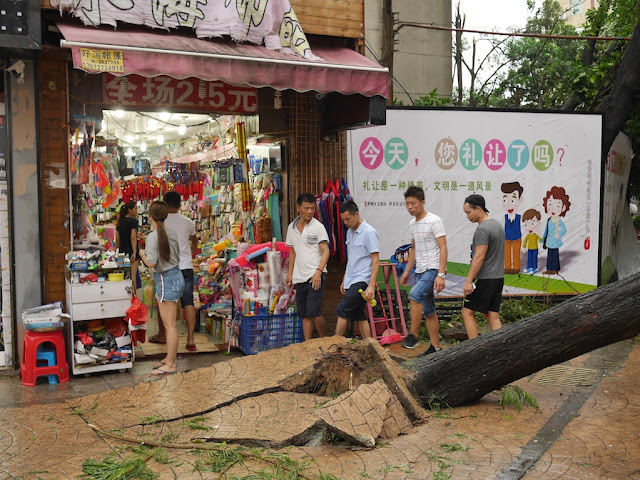 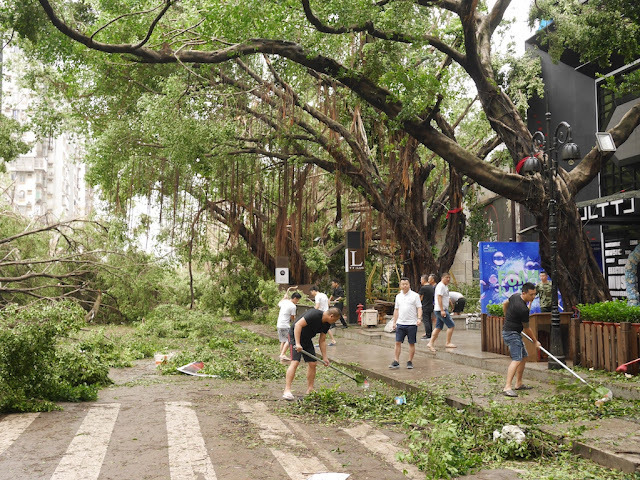 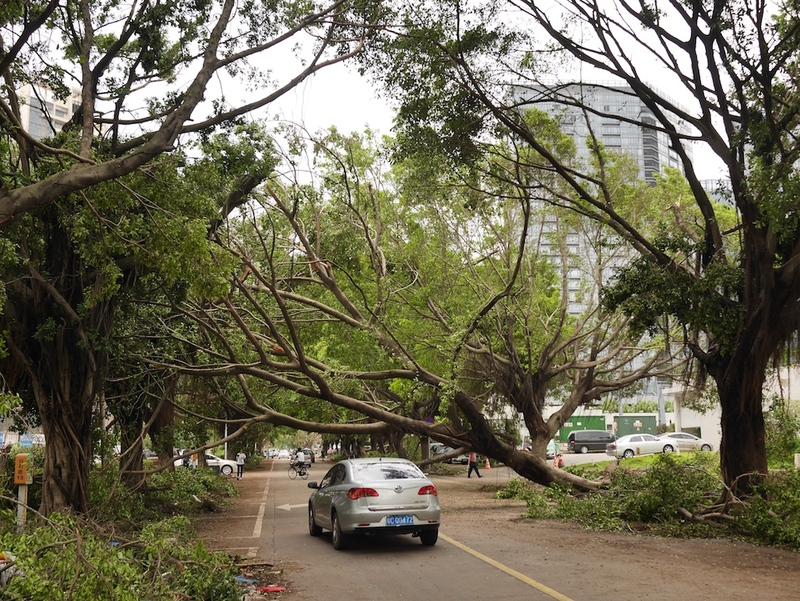 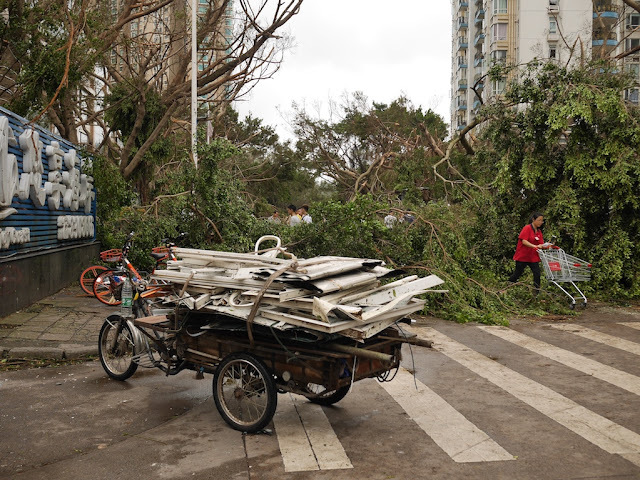 Though it wasn't as dramatic as the damage on the Lianhua Road Pedestrian Street, just hours after Typhoon Hato hit Zhuhai there were downed and damaged trees on Yuehai East Road as well. There were also a number of downed road signs not far from the waterfront. 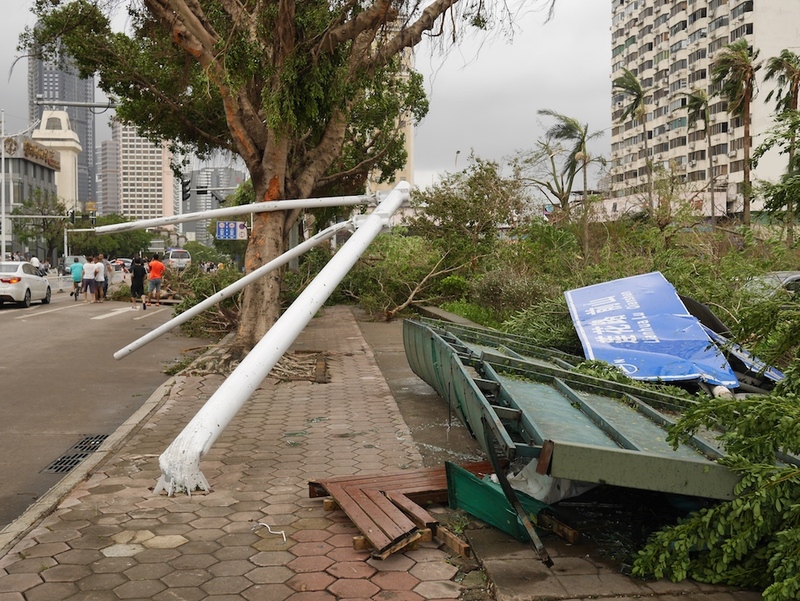 More worrying was one partially damaged street sign which slowly swung above people walking by, typically unaware of it. 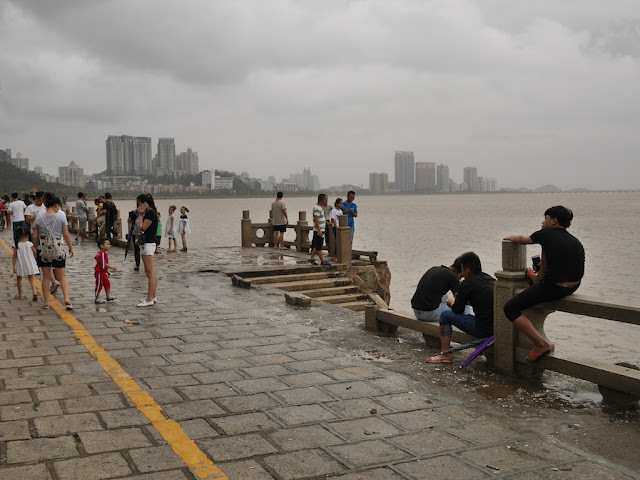 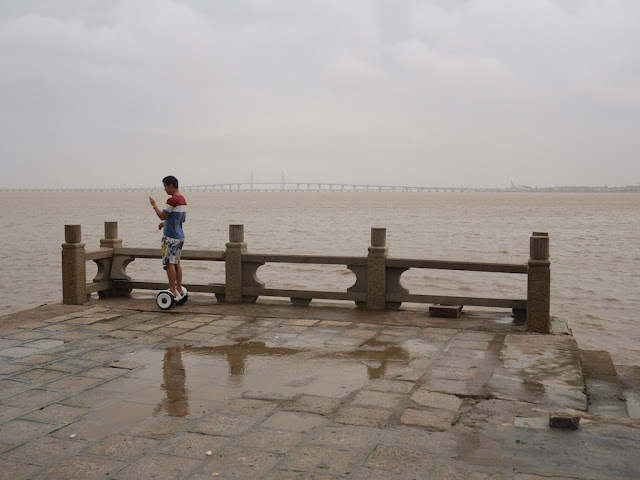 Perhaps in part because it was difficult to go elsewhere, many people were out as usual at the coastline walking area along Qinglu South Road (Lovers' Road). 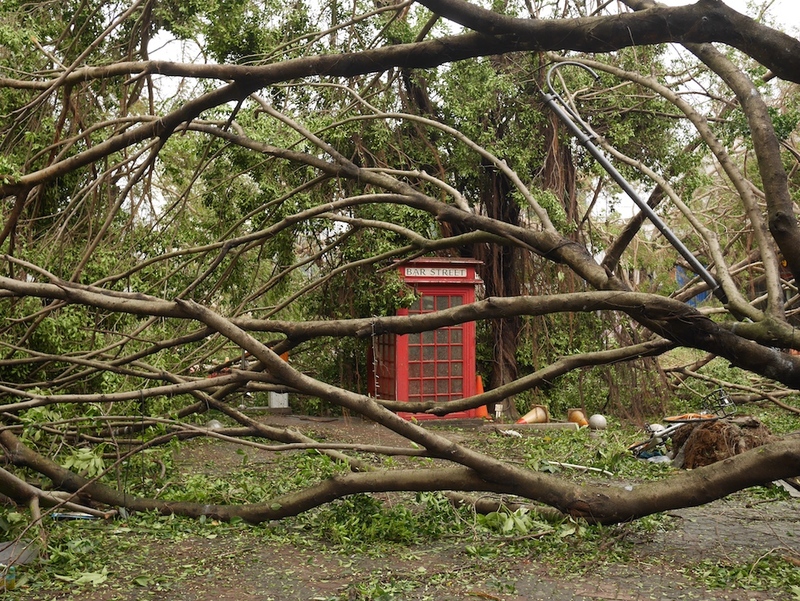 Thought it wasn't hard to spot damage there as well. Portions of the stone railway had been destroyed. 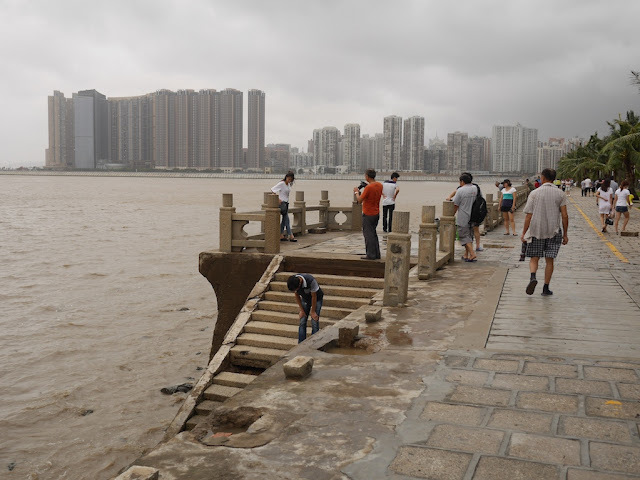 Some of railing could be found on the other side of the walkway. 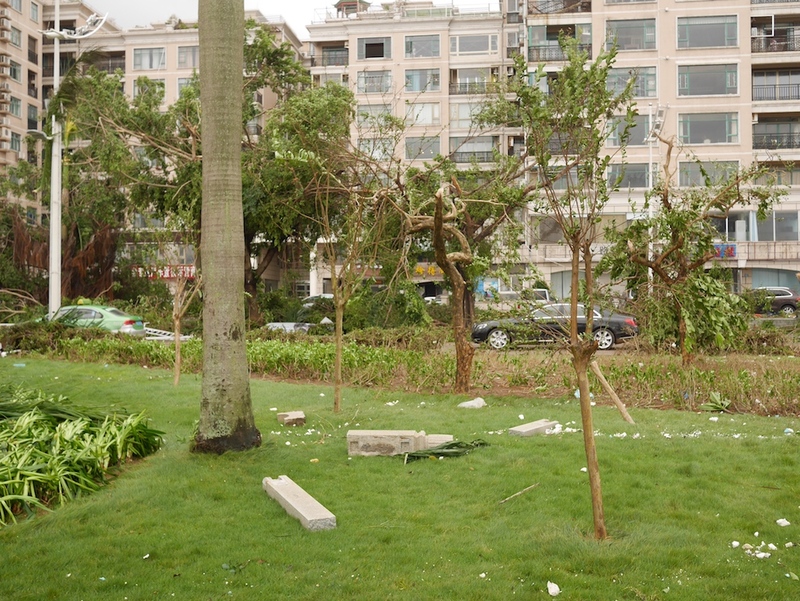 Even with the debris around, one young man rolled about on his self-balancing scooter. 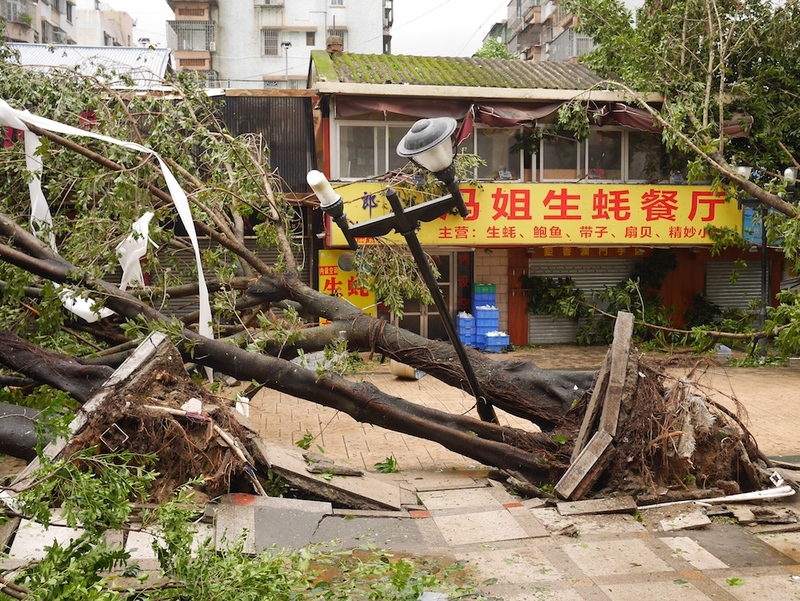 Off of Qinglu South Road, Lian'an Road was easy to miss. It had been hidden by yet another fallen tree. Further along Lian'an Road were more signs of the storm. 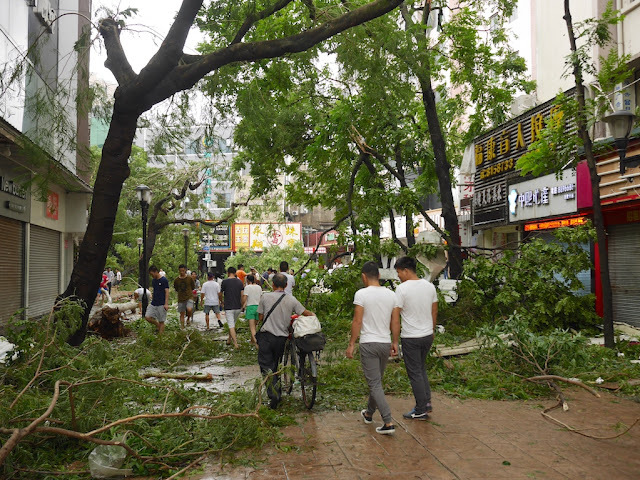 At this point, I came to a portion of Shuiwan Road which had been especially transformed by the typhoon. 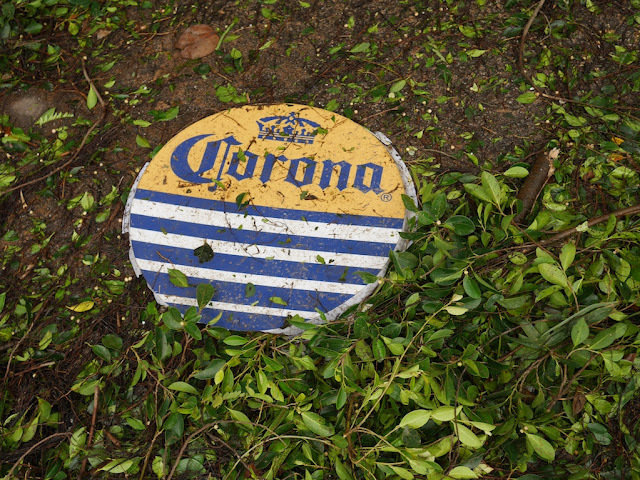 More to come . . . 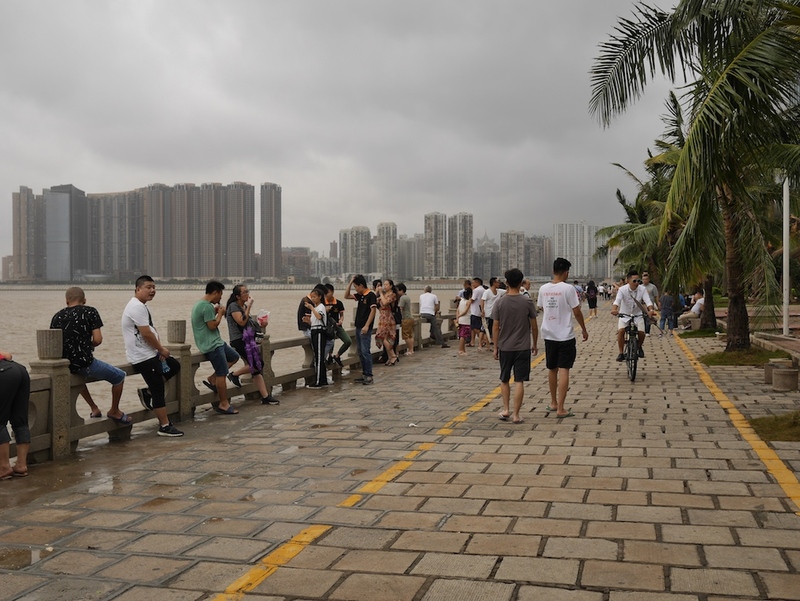 The Lianhua Road Pedestrian Street leads from the land border between mainland China and Macau to areas farther north in Zhuhai. 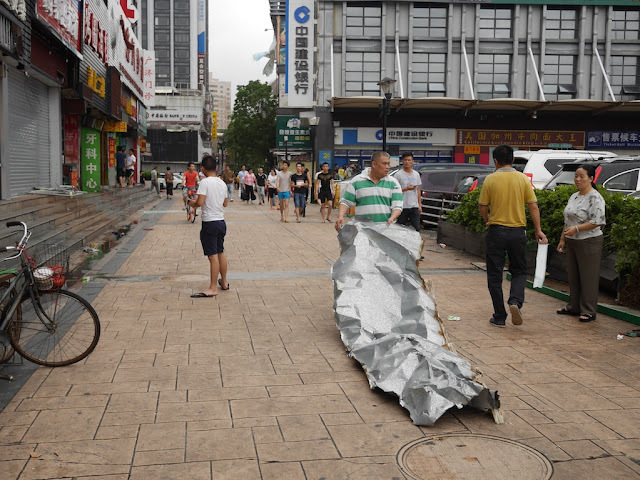 Along and near the well-trafficked pedestrian street are many restaurants, hair salons, clothing stores, and other businesses. 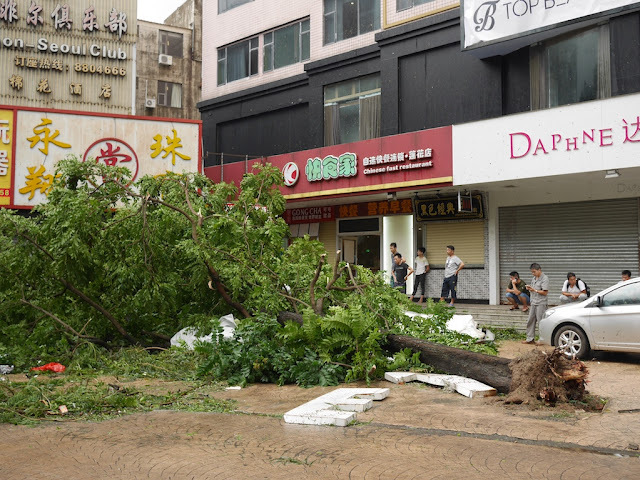 Below are some photos taken just hours after powerful Typhoon Hato hit Zhuhai, China — obviously not a typical moment for the street. 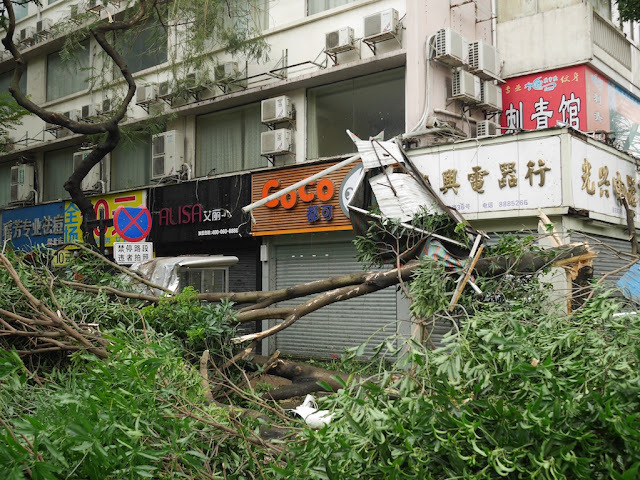 The scenes capture some of the destruction there and how life continued, such as people walking through and around large fallen trees, a man petting a dog at a typically closed-off construction site, and one of the very few stores on the street already welcoming customers once more.